Your kitties come from a species of well-known predators who mark their territories using their excreted bodily fluids. Many cats mark the area to make an easy path for them to return or remember that certain spot. With this being factual, a lot of owners end up with the question “Can cats share a litter box?”. Keep reading as we will discuss the common things you see in a litter box and the different effects they have on your pets. So, how many litter boxes for 2 cats are recommended? Vets and kitty experts have recommended that every cat you have in the house should have one each, then you add one extra box. This way, it gives them the liberty of going into different places which can minimize the accidents. As stated, cats come from a territorial race where they get very particular about other pets using their space. If you try to share one litter box for your two cats, you’ll most probably run into a catfight or a huge mess. This should help your cats go whenever they want without having to rush, fight for the litter box or create an accident. 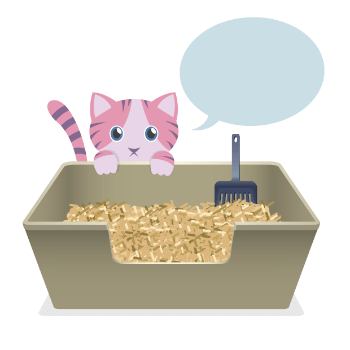 Can Litter Boxes Make A Difference? There are many litter boxes available on the market which are made of different materials. You’ll see open-trays, cat-hooded ones, disposable sacks, even self-cleaning litter boxes! Now, how much you’ll spend on them depends on the type of material used, function, and size of the kitty that you have at home. If you are lucky enough to score a nice deal, you’ll see some of the brands that offer a bundle for this kind of product and match it with cat litter. Some cats may find a certain litter box repulsive because it just does not appeal to them. You can stop the battle for the box by identifying what your pets prefer. If they like different designs, then consider yourself lucky because you might have just found the perfect solution. Another trick is to find different types of litter to distinguish what each cat prefers. Some are against coarse litter and other kitties enjoy the roughness of it. Covered – some cats enjoy their privacy when using the loo and others have a fear of enclosed spaces. Try to experiment between your cats and see which of them enjoy this type of litter box more. Low-sided Pan – this is sort of a universal kind of litter box which any cat can use. Try making the designs different or look for a color which one cat loves and the other rejects. High-sided Box – some cats might express dominance whether they are senior or not. Getting this type of litte box will definitely give your senior kitty a second thought and use either the lower or the covered one. This gives younger cats more freedom and a little more privacy than the low-sided pan. Automatic – this type can clean the waste instantly and keep it in a sealed bag for disposal. Buying this can help any of your cats lose their fear of the other since the smell or territorial odor will be cleaned out after use. Non-Clumping Clay – made of several other clays that do not solidify when absorbing urine. It gets smelly faster so you should clean this out often. Silica Gel Crystals – made out of silica beads, it controls odor better than the first two types and is a little bit more expensive. Some cats do not prefer this since they find the beads on their paws highly unfavorable. There are a lot of other types you can choose from which are all available at your nearest pet store. If you are a DIY type of cat parent, then you can definitely find resources such as a storage bin or old basket that you could transform into a personalized litter box. All you would need to do to complete it would be the type of cat litter you’d like to use. For you to ensure that your cats do the deed in the right places, you’ll need to set the litter boxes in appropriate areas and lead your cats to these boxes for them to remember where they are. The best thing to do is place each box in a room that is far away from each other. Placing each litter box in its own space will reduce the amount of battling since they are too far apart to be guarded by one cat. This will also give you time to clean each box without having to disturb the kitties or interrupt any sudden urge to go. Forcing a litter box for two cats can give adverse mental and physical effects to either one or both of them. If your pets are adopted together at a young age, you may begin to practice a “sharing is caring” kind of lifestyle. However, as they grow older, these lessons and training can still be disregarded because they choose to abide by their territorial attitude. Here are some of the negative effects that you will see present if your kitties try to share the loo. One of the pets would start looking for a different place to go, like even your bed. Although training them to share the litter box at an early age saves you money upfront, changes in their attitude can result in effects far worse than what is listed. This can result to more trips to the vet in case a serious illness needs to be cured. Another would be the fact that more money will be spent on bandages to aid your kitty in recovering from catfight blisters. With all of these taken into consideration, we do not recommend that you accustom your cats into sharing the litter box. Not only will it cause stress and discomfort but it could also pass off as not caring. Cats are very sensitive and can feel when they are not being taken care of. This can result in disruptive behavior which will cause every living thing in the house (including you) a great deal of stress. If you have two or more cats at home, make sure that you have the adequate number of litter boxes to accommodate them. They certainly share your love but that doesn’t necessarily mean that they have to share the litter box too.